4. Let It Go from "Frozen"
Award-winning San Francisco trio, consisting of an exquisitely beautiful mix of harp, violin & cello. Amethyst is also a piano trio that is equally at home with classical, pop/rock & jazz and a flute trio. Having played for film scores, MTV videos, touring artists live and in recording studios, Amethyst is probably the most versatile professional trio in the Bay Area. Our pianist is also a harpist and flutist, providing a wide variety of instrumentation as well as styles. We also have an offshoot Celtic folk trio that specializes in Irish and folk fiddling called Celtic Sands. We also provide a top-of-the-line amplification system for our music when needed and play special requests. The music was wonderful! Our guests raved about the beautiful music. It was perfect for out 25th anniversary party. Even our oldest and youngest guests could dance to the music. Would hire them again when needed. We booked the Amethyst Trio for our guests at our hotel for New Years Eve. Very prompt in arrival and starting time. The musicians were fantastic. We really enjoyed the ambiance that their music provided. The guests really enjoyed it as well. I will be booking them again. Thank You Amethyst Trio! Lara Garner, LLana Thomas, Samsun Van Loon with vocalist Pamela Connelly played a magnificent concert for us Veterans at Yountville, Ca. on 1/27/13. The choices of music and the professional executions with such feeling moved us greatly. It is an experience not to be missed and we look forward to having them back soon. Thank you, we loved you. Lara did a beautiful job performing the music for our wedding ceremony. It was unforgettable! The Amethyst Trio was the perfect classy complement to our company holiday party. They arrived on time and the music set was very pleasant. I will definitely consider them again for my next event. We hired the cellist to play solo during the celebration of the 200th anniversary of the birth of Baha'u'llah, the prophet and founder of the Baha'i Faith. He did a spectacular job of providing music appropriate for our semi formal event. The Baha'is in Fremont are grateful and highly recommend him. The amethyst trio was such a wonderful addition to our wedding. Lara and her fellow musicians were professional, kind, talented and over all wonderful. They were easy to work with and had great advice from the best generator to rent to where to place the sound system. There were a few things people commented on after the wedding and the musicians were the most mentioned special touch that people loved. They were also my favorite part. When they started playing before the wedding ceremony I got rather overwhelmed with happiness. If you want some string instruments at your special event you can’t go wrong with this group. Also they have a list of songs they can play plus a smaller list of sample songs on their website you can listen to. And they are on YouTube! All of these things were very helpful in picking out our music for the ceremony and for afterwards. Thank you for your talent and beautiful addition to our day...you made the ceremony memorable! They did a great job with what we asked of them. They were even able to change up the music at last minute which was super awesome and we were very grateful for that. 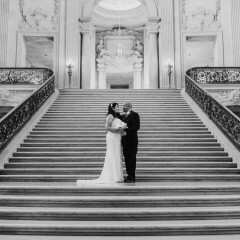 I hired Amethyst Trio for my San Francisco City Hall Wedding and they were wonderful! On time, professional, and the music was amazing! Lara was fantastic before the wedding in providing options with regard to style of music, etc. The music they played at our garden wedding was fantastic and truly added a magical element to the ceremony. 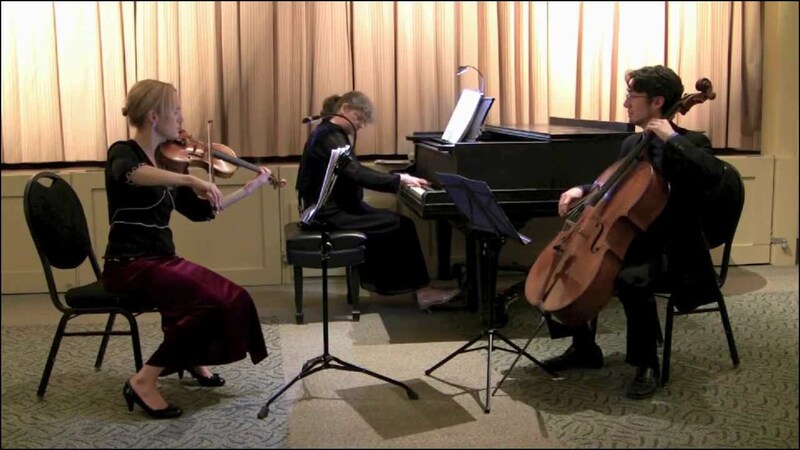 You should definitely have Amethyst Trio on your short list of musicians to play at your special event! We were very satisfied with our duo! beautiful sounds for our wedding. I hired a duo of violin and piano for my wedding ceremony and I couldn't be happier. They helped me since the beggining making suggestions of songs, they arrived at the venue much earlier to make sure everything would go well. And the most important thing: GREAT ARTISTS! I still remeber how wonderfully they played the songs we choose. 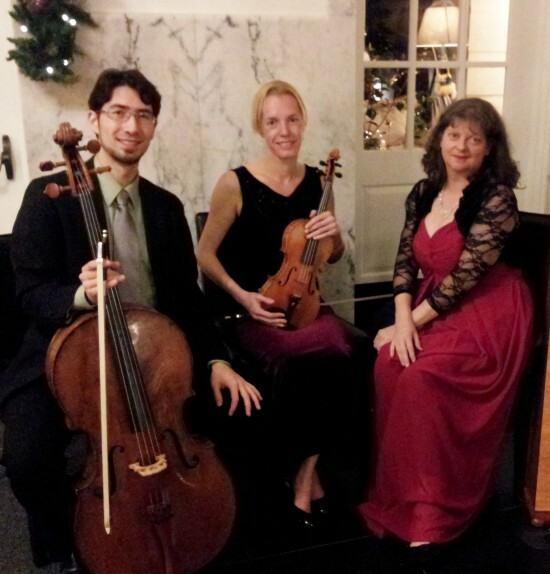 The Amethyst Trio performed very well during our wedding at Silver Creek Valley Country Club. Regardless of where our guests were sitting they could be heard with the amplification agreed upon between them and our DJ. Samsun arrived on-time (early) and did a fantastic job on the cello. He was a pleasure to work with and a true professional. I highly recommend him. Lara, pianist, and a cellist gave phenomenal performance. My mother was a professional cellist and this was in her honor. Several people commented how amazing they played and how respectful they were coming on and off stage. They played exactly what I requested, including a complex Brahms piece. The performance of the Brahms was moving. And the complex interplay between piano and cello flawless. Lara was responsive and very professional in the planning phase. We also spoke on the phone to make sure everything was done to my request. Highly recommended, flexible, flawless performance for a reasonable price. Thank you Amethyst Trio for making my mother's memorial special. Truly made our event wonderful! We had our office Holiday party last Thursday and I cannot say how wonderful it was having Amethyst Trio play at our event. They arrived early, and played very mood appropriate music for 2 hours and it really did make our whole event. It was wonderful, very talented musicians, incredibly nice and easy to work with. I will definitely be booking them again! We received complient after compliment on how beautiful the music was. We would definitely book again! I had absolutely no worries! Mia was hired to perform at our wedding ceremony. The music was lovely. She was punctual, professional & flexible, which really put us at ease as things did not go according to plan and we can had to move our ceremony indoors due to rain. They showed up on time, played beautiful music, and were very accommodating to our needs. Great job! Will definitely use for future events. Matt was the violinist who was at my wedding. He did amazing!! Complemented the ceremony beautifully, couldnt have gone better. From start to finish, it was easy to book, accommodated my micro small wedding (10 people including my husband and I) lots of communication, and reliable. Would book them again for my next event definetely! We were treated to an absolutely wonderful performance by Lara and her cellist colleague. The occasion was a 90th birthday celebration for a very special lady and having these two very talented musicians play during the luncheon added so much to our party. Not only was the music they played beautiful and appropriate but we also found our interaction with the duo to be pleasant and cooperative. All attendees had positive and complimentary comments regarding Lara and her colleague. We will certainly include the Amethyst Trio in our future entertainment plans and do highly recommend them to those seeking talented musicians to play at their events. Classy, punctual and music was great! Complete package and everyone enjoyed the performance. Lara came to play at our small reception yesterday and we wanted some background piano music that was a little peppy. She was very nice and professional, got there early, and played wonderfully. Everyone loved the pieces she played! If we have another event I will be booking her again! We hired the Trio for our wedding in St Ignatius Church. They were amazing, professional and sounded absolutely awesome. Let's first say that we attended regular service at St Ignatius to see how the audio would be, prior to the wedding. The church echos and makes audio sound subpar. However, the Trio somehow made their instruments sound absolutely perfect. Crystal clear with perfect notes. In addition, the Trio also learned every song they didn't know (Catholic Church hymns that are not regularly played) and played every known song so well. The timing was also suberp. Lara also helped us find a classically trained cantor, who was one of the best singers I've ever heard. They coordinated well with the church piano player, the cantor, and a female vocalist who did some duets (particularly The Prayer, which sounded amazing) - whom the Trio never met prior to the wedding. They're so helpful and were so perfect for the wedding. We hope to hire them again for any future events! We had Laura play for our club's 57th Anniversary party. She was not only delightful but her talent is outstanding!!!! She spoke with guests, explained the harp and played so beautifully that when it was over and she was leaving everyone applauded. SHE WAS THE HIT OF THE EVENING!!!!!! Lara (flute) and her partner violinist did an awesome job. Even though I was 1/2 hr late, they arrived exactly on time, prepped for the moment, hung in there and knocked it out of the park when I got there. Thank you again Lara. You two made our day yesterday. I hired Lara from Amethyst Trio to play the harp during my wedding ceremony and the cocktail hour in Napa. She was extremely helpful during the pre-wedding process of picking songs for the different part of the ceremony, and was even able to fulfill a last minute request we had to play "Stairway to Heaven"! I got numerous compliments on how beautiful the music was during the ceremony. I would definitely recommend Lara. The Amethyst Trio was an amazing group to work with! We hired the pianist and violinist for our August wedding in Sonoma to play for one hour during the ceremony. They were both wonderful to work with from the beginning - very prompt, answered all of our questions and worked closely with us on all of the specific songs that we wanted during the ceremony. They were timely and very nice to work with and to have at our wedding - the music was so beautiful and we couldn't have asked for better musicians on our special day. 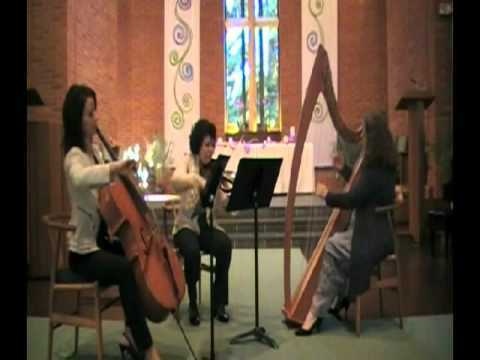 I'd highly recommend working with the Amethyst Trio for your wedding or special event! Beautiful music! Wonderful music! What a talented group! They played for my wedding and it was beautiful. I received a lot of compliments from my guests and family on the music. I really appreciate the effort they put in to play all my special requests. They were also very easy to work with. Insurance: $1,000,000 - Performers insurance. Policy will be provided upon request. Concerts consist of a pianist, violinist & cellist; can also include a singer and added instruments. Music styles upon request vary from purely Classical to pop/rock, opera and other styles. The other configuration is violin, cello & harp. The pianist is also a harpist and a flutist, so there are a lot of instrumental choices. The Amethyst Trio is a Classical and crossover pop rock trio. 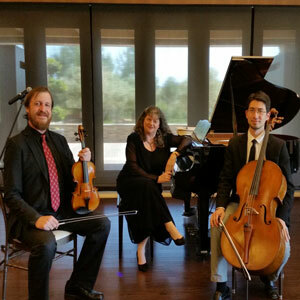 It consists of a lovely Classical trio of strings and harp, as well as a rockin' trio of piano and strings, providing a variety of contemporary styles as well as wedding classics. We play over 100 concerts and events every year. All our musicians have music degrees from prestigious music schools and have performed throughout the country and in europe. We have played in such venues as Carnegie Hall, Davies Hall, the San Francisco Opera and from time-to-time go on tour to different parts of the country and Europe. We have also played celebrity weddings, the latest being for Metallica bass guitarist Jason Newsted. We play many special requests and provide suggestions to brides about musical selections, helping them throughout the process. We also provide amplification when needed (at no extra cost). Our goal is to make your wedding or event as memorable and magical as possible. The music is essential. Amethsyt Trio can provide their own amplification equipment upon request. All the instruments have pickups inside, so can be converted from purely acoustic to amplified sound - including the harp. The violin and flute have wireless systems as well as cabled systems. Our repertoire is too large to list - everything from Mozart to Journey. "I can only give you an A++++. Your music was fantastic and was the crowning point to the wedding. I had so many wonderful comments on your song and the arrangements and music choices. I have been planning this wedding for my daughter's entire lifetime in my mind and you were a very important part of it. Thank you and your group from all of us." "We could not have had a better experience. 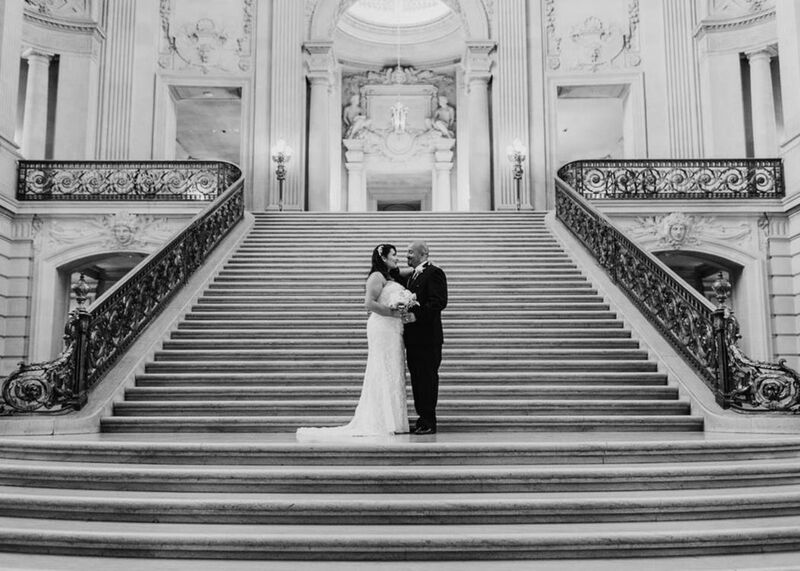 They were a joy and certainly added to our beautiful wedding!" "I can't say enough good things about the Amethyst Trio. They played from a very impressive repertoire for the three hours of our wedding reception and, even though there were 60 people in a relatively small space, their sound never "got in the way" of conversation. Lara is dependable, flexible and accommodating;three very important adjectives for the business she's in;and I wouldn't hesitate in giving her my highest and most enthusiastic recommendation!"